A painting of Muhammad XII of Granada, last Muslim sultan in Spain. Date of this painting and its current location are unknown. Abu `Abdallah Muhammad XII (Arabic: أبو عبد الله محمد الثاني عشر‎ Abū ‘Abdi-llāh Muḥammad ath-thānī ‘ashar) (c. 1460 – 1533), known to the Castilians as Boabdil (a Spanish rendering of the name Abu Abdillah), was the 22nd and last Nasrid ruler of the Emirate of Granada in Iberia. Muhammad XII was the son of Abu l-Hasan Ali, Sultan of the Emirate of Granada whom he succeeded in 1482, as a result of both court intrigue and unrest amongst the population at large. Muhammad XII soon sought to gain prestige by invading Castile. He was taken prisoner at Lucena in 1483. Muhammad's father was then restored as ruler of Granada, to be replaced in 1485 by his uncle Muhammed XIII, also known as Abdullah ez Zagal. 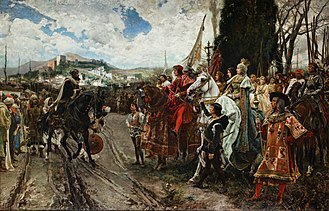 Muhammad obtained his freedom and Christian support to recover his throne in 1487, by consenting to hold Granada as a tributary kingdom under the Catholic monarchs. He further undertook not to intervene in the Siege of Málaga, in which Málaga was taken by the Christians. Following the fall of Málaga and Baza in 1487, Almuñécar, Salobreña and Almería were taken by the Christians the following year. By the beginning of 1491, Granada was the only Muslim-governed city in Iberia. The Moorish sultan, with about eighty or a hundred on horseback and very well dressed, went forth to kiss the hand of their Highnesses. According to the final capitulation agreement, both Isabel and Ferdinand will decline the offer, and the key to Granada will pass into Spanish hands without Muhammad XII having to kiss the hands of Los Reyes, as the Spanish royal couple became known. The indomitable mother of Muhammad XII insisted on sparing her son this final humiliation. After your Highnesses ended the war of the Moors who reigned in Europe, and finished the war of the great city of Granada, where this present year 1492 on the 2nd January I saw the royal banners of Your Highnesses planted by force of arms on the towers of the Alhambra. Legend has it that as Muhammad XII went into exile, he reached a rocky prominence which gave a last view of the city. Here he reined in his horse and viewed for the last time the Alhambra and the green valley that spread below. The place where this allegedly took place is today known as the Suspiro del Moro, "the Moor's sigh". Muhammad mourned his loss, and continued his journey to exile accompanied by his mother. Muhammad XII was given an estate in Laujar de Andarax, Las Alpujarras, a mountainous area between the Sierra Nevada and the Mediterranean Sea, but in October 1493 he crossed the Mediterranean to Fes, Morocco, accompanied by an entourage of 1,130 courtiers and servants. Large numbers of the Muslim population of Granada had already fled to North Africa, taking advantage of a clause in the articles of surrender that permitted free passage. ...The lord of Castile has proposed for us a respectable residence and has given us assurances of safety to which he pledged by his own handwriting, enough to convince the souls. But we, as descendants of Banu al-Ahmar, didn't settle for this and our faith in God does not permit us to reside under the protection of disbelief. The 17th-century historian Al-Maqqari wrote that Muhammad XII crossed the Mediterranean to Melilla then went to Fes where he built a palace. He stayed there until his death in 1533/1534 (in 940 A.H.). He was buried near the Musala (place of the special prayer during the Islamic festivals) located outside of "Bab Sheria" in Fes. Muhammad XII was survived by two sons; Yusef and Ahmed. Al-Maqqari met with his descendants in 1618 in Fes; they lived in a state of poverty and relied on the Zakat. Spanish chronicler Luis del Mármol Carvajal wrote "Muhammad XII died near the Oued el Assouad (Black River) at ford told Waqûba during the war between the Marinids and the Saadians." This source is also taken by Louis de Chénier, a diplomat of King Louis XVI of France, in his Historical research on the Moors and History of the Empire of Morocco published in Paris in 1787. Sword of Boabdil, Musée de Cluny. He is a main character in John Dryden's "Conquest of Grenada", a heroic drama in two parts, 1672. He was the subject of the three-act opera "Boabdil, der letzte Maurenkönig", Op. 49, written in 1892 by the Jewish-German-Polish composer Moritz Moszkowski. Spanish composer Gaspar Cassadó wrote the Lamento de Boabdil for cello and piano, in memory of the king. Spanish composer Antón García Abril wrote the 'Elegía a la pérdida de la Alhambra' from his song cycle Canciones del Jardin Secreto for voice and piano; it is set to text (in Andalusian Arabic) that is attributed to Boabdil, in which he laments the loss of the Alhambra. Abu Abdallah appears as the main character in "De Ongelukkige" published in 1915 by Dutch author Louis Couperus. This novel covers the last decade of Abu Abdallah's reign as ruler of the Emirate of Granada. He figures in the video game Assassin's Creed II: Discovery for the iOS and Nintendo DS, as an ally of the Assassins. He is portrayed by Khalid Abdalla in the film Assassin's Creed (2016). Andalusian singer-songwriter and poet Carlos Cano [es] dedicated a song to Muhammad XII in his album Crónicas Granadinas, entitled Caída del Rey Chico. Salman Rushdie's book, The Moor's Last Sigh, also features consistent references to Muhammad XII. He appears as a character in Leo Africanus by Amin Maalouf. Louis Aragon's book Le Fou d'Elsa renders a dramatized and poetic version of the story of Granada's capture, which includes Muhammad XII as one of the two main characters present in the novel, (Majnun being the other. Elsa, whom it could be argued is the second major character, is absent from the book.). Pakistan Television Corporation (PTV) produced a drama in 1980, based on the novel "Shaheen" by Nasim Hijazi. In this drama Abu Abdullah Mohammad was played by Shakeel Ahmed. Also in 1980 (22 November until 7 February 1981), appeared in the comics supplement to the Portuguese newspaper A Capital a 12-page comics story on the conquest of Granada with Boabdil as the main character, Luz do Oriente ("Light of the Orient"). The script was by popular literature writer and bookman Jorge Magalhães and the drawing was by Portuguese-Guinean sculptor, painter and comic book artist Augusto Trigo. Boabdil appeared as main character in Spanish eight-episode serial Requiem por Granada (1991). In this serial, he was played by Manuel Bandera. Young Boabdil was played by Lucas Martín. Boabdil appeared as main character in the season two of the Spanish TV Series Isabel (2013). In this show, he was played by Álex Martínez. He appeared as a main character in the novel Court of Lions (2017) by Jane Johnson. Drayson, Elizabeth (2018). The Moor's Last Stand: How Seven Centuries of Muslim Rule in Spain Came to an End. Interlink. ISBN 1566560497. The first full account in any language of the last Muslim king of Spain. Lytton, Edward Bulwer Lytton (1838). Leila; or, The Siege of Granada. London. Retrieved January 31, 2018. This is a historical novel from 1838, and should not be used as a historical source. ^ a b c d Chisholm, Hugh, ed. (1911). "Boabdil" . Encyclopædia Britannica. 4 (11th ed.). Cambridge University Press. p. 94. ^ Harvey, Leonard Patrick (1992). Islamic Spain, 1250 to 1500. Chicago: University of Chicago Press. p. 327. ISBN 0-226-31962-8. ^ Shillington, Kevin (2005). Encyclopedia of African history. 1. CRC Press. p. 220. ISBN 1-57958-245-1.